===================================== EELS SHOW DESPERATION IS KING BEAT TITANS 27-2. Parramatta are now just one game away from the Grand Final... try and digest that for minute. Remember this is the same team that had their fans desert them mid-season when they look potential wooden spooners... now they are the hottest team in Rugby League. 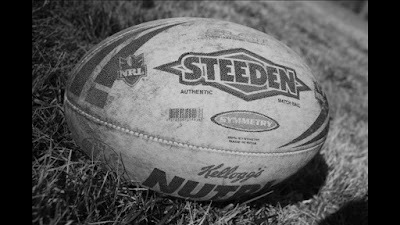 The Eels were way too good for a pathetic Gold Coast Titans side at the SFS on Friday Night, running out 27-2 winners. The Titans played boring, unimaginative football that had carried them well throughout the regular season but with their season on the line, the structured set for a last tackle kick option was badly outdated and the Eels defended it easily. Good news for Parramatta fans is that Jarryd Hayne didn't have a barnstormer and that means he's got at least one more left in him in 2009. For the Titans only Preston Campbell truly tried to spark the team, while Scott Prince was either hamstrung by a terrible game plan or had a brain melt when his team needed him to think on his feet and adapt to the contest. The NRL Finals Tweet was on hand to catch all the action that was worthy of a tweet and it has been compiled below in chronological order. For future reference - the front page of this website will automatically feed the Twitter Updates onto the right side of the website - so if you don't have Twitter you can follow the notes there. 27 def. 2 EELS 27 (Feleti Mateo, Ben Smith, Kevin Kingston, Jonathan Wright Tries; Luke Burt 5/5 Goals, Jarryd Hayne 1 Field Goal) defeated TITANS 2 (Scott Prince 1/1 Goal). As it happened - Eels 27 def. Titans 2. (The numbers are an unavoidable formatting byproduct of pasting in the Tweets - apologies) 68. NRL Finals: 1st Elimination Final - Eels v Titans Updates during the game. Titans remain the pick here. 7:09 PM Sep 18th from web 67. Zillman starting at fullback, Rogers to centres, Henderson starting at prop, White & Atkins to bench. Wright for Inu only Parramatta change. 7:35 PM Sep 18th from web 66. Good looking crowd at SFS. Semi Finals should be played here every year. 7:53 PM Sep 18th from mobile web 65. Like the Gold Coast reshuffle. Harrison KOd trying to tackle Lowrie in first set. Setback for Titans. 7:57 PM Sep 18th from mobile web 64. Tagataese into game after 36 seconds for an unsteady looking Harrison. 7:58 PM Sep 18th from mobile web 63. Go forward solid for both teams in opening sets. 8:01 PM Sep 18th from mobile web 62. Prince grubber creates first opportunity. Hayne cleans up booting ball into touch. 8:03 PM Sep 18th from mobile web 61. Gold Coast take easy penalty goal for off side in front of Parra's posts. GLD 2-0 after 7 mins. 8:05 PM Sep 18th from mobile web 60. Hayne makes something happen but Zillman has nice counter attack. Mortimer struggling with bruised back. 8:08 PM Sep 18th from mobile web 59. Mateo into game nice and early this week. 8:11 PM Sep 18th from mobile web 58. Ben Smith knocks on as Parra start to look dangerous. Nice grab at arm by Rogers. 8:12 PM Sep 18th from mobile web 57. Still GLD 2-0 after 15 minutes. Parra on attack. 8:14 PM Sep 18th from mobile web 56. Tagataese with an error forcing tackle on Hayne. Well done. 8:15 PM Sep 18th from mobile web 55. Titans will target young Wright in defence all night and it will pay off. 8:16 PM Sep 18th from mobile web 54. Mateo makes mockery of Laffranchi's defence. PAR 6-2 after 22mins. 8:21 PM Sep 18th from mobile web 53. If Hayne scores then... I don't even want to try and think of how I'd have explained it. Harrison back on. 8:23 PM Sep 18th from mobile web 52. Offloads starting to hurt Titans big time. 8:24 PM Sep 18th from mobile web 51. Terrible mistake by Prince off kick, Parra can pounce here... 8:25 PM Sep 18th from mobile web 50. Ben Smith does it again... knock on that is, not score. Titans let off hook 8:26 PM Sep 18th from mobile web 49. Good rebound set by Gold Coast. Need to play some football in Parra's half for a bit. 8:27 PM Sep 18th from mobile web 48. How was that not a knock on by Robson? 8:29 PM Sep 18th from mobile web 47. Gold Coast were getting some ball in good spots before that Meyers error. Now a penalty... 8:31 PM Sep 18th from mobile web 46. Robson cross kick taken by Concrete Hands Ben Smith! Parra out to 12-2 lead if Burt converts. 8:33 PM Sep 18th from mobile web 45. Burt kicks it. PAR 12-2 after 36 mins. 8:34 PM Sep 18th from mobile web 44. Preston Campbell looking dangerous but Titans must not let Parra in again before HT. 8:36 PM Sep 18th from mobile web 43. Titans should see out this set to halftime... I stress should. 8:38 PM Sep 18th from mobile web 42. But they didn't... That's a coach killer... 8:38 PM Sep 18th from mobile web 41. Field Goal by Hayne is uncontested... PAR 13-2 at halftime. 8:39 PM Sep 18th from mobile web 40. EF1 Halftime: Parramatta 13 (Mateo, Smith Tries; Burt 2/2 Goals, Hayne 1 Field Goal) lead Gold Coast 2 (Prince 1/1 Goal). All Parra so far. 8:42 PM Sep 18th from web 39. EF1 HT Best: PAR- Hindmarsh, Hayne, MoiMoi, Keating, Lowrie, Robson, Mateo. GLD- Campbell, Minichiello, Mead, Rogers, Henderson, Walker. 8:43 PM Sep 18th from web 38. @myGoldCoast old Concrete Hands did mock that tweet later on.. not looking good for the Titans at halftime. Errors & missed tackles a go-go. 8:45 PM Sep 18th from web in reply to myGoldCoast 37. NRL Tweet breaks news that Inu won't play in Eels-Titans game... at halftime of the actual match... @nrl 8:48 PM Sep 18th from web 36. Hindmarsh just piles up the numbers: 23 tackles, 11 hitups by halftime. Stats aside I still can't believe he isn't an Origin player anymore 8:50 PM Sep 18th from web 35. The confidence I had in the Titans attack isn't completely lost... but get the ball across halfway first. Even possession they are a chance. 8:53 PM Sep 18th from web 34. Hayne looking dusty after tackle to start second half... How serious? 8:57 PM Sep 18th from mobile web 33. Not serious enough for Titans to force him into touch, great play. 8:57 PM Sep 18th from mobile web 32. Time for the Titans forwards to stand up and give the backline some field position... 8:59 PM Sep 18th from mobile web 31. I completely agree with Gus Gould... 4th tackle settlers should be illegal inside the attacking 20. 9:00 PM Sep 18th from mobile web 30. This Gold Coast set/s have to produce points... 9:01 PM Sep 18th from mobile web 29. But they don't... Matt White knocks on over the line... 9:02 PM Sep 18th from mobile web 28. Hayne kicks out on the full... Going for a slow the game down kick... 9:03 PM Sep 18th from mobile web 27. Try some ad lib football Titans.. This structured stuff is boring and lifeless... 9:04 PM Sep 18th from mobile web 26. That'll do me Scott Prince... Try passing at the line instead of falling back on that little grubber as your only attacking move... 9:06 PM Sep 18th from mobile web 25. Grothe makes a break and I'm close to calling this one over if Titans aren't interested in playing attacking desperate football... 9:08 PM Sep 18th from mobile web 24. Parra have been all over the play the ball all night... Finally a penalty.. And Minichiello throws advantage away. 9:09 PM Sep 18th from mobile web 23. Huge play from White... Here's the last roll of the dice for mine. 9:11 PM Sep 18th from mobile web 22. Is Snake Eyes the right term for failure in dice speak? 9:12 PM Sep 18th from mobile web 21. Campbell is the only Titan with any spark... And Walker when he finally gets the ball. Prince is having an abysmal match... 9:14 PM Sep 18th from mobile web 20. GAME OVER! Kingston scores off Burt line break... Video ref called on. 9:15 PM Sep 18th from mobile web 19. If you've seen the video preview you need to know I'm winding up Parra fans as much as picking the Titans... Here comes the abuse... 9:16 PM Sep 18th from mobile web 18. PAR 19-2 and we have a Dogs-Eels Preliminary Final... Although 1998 semi anyone? 9:17 PM Sep 18th from mobile web 17. This result says everything about how a team wanting it more beats a regular season system in every Finals match. 9:19 PM Sep 18th from mobile web 16. 28,000 odd ain't bad... About the total of 3 Parra home games mid-season. 9:20 PM Sep 18th from mobile web 15. MoiMoi's my man of the match... Ok second to the amazing performance by Nathan Hindmarsh tonight. Parra thoroughly deserve this victory. 9:21 PM Sep 18th from mobile web 14. As for the Gold Coast... One of the worst semi final performances I've seen in recent memory, and J Wright just rubs it in by touching down 9:23 PM Sep 18th from mobile web 13. Burt converts. PAR 25-2 with 69min gone. Bye bye Titans. 9:24 PM Sep 18th from mobile web 12. This is a smart choice by Cayless. Hayne is fired up throwing arms, sneaky forearms and needs some time to cool down. PAR 27-2 after 74mins 9:30 PM Sep 18th from mobile web 11. @oherrol anyone got Chris Brown's number? Sorry too easy... 9:31 PM Sep 18th from mobile web 10. Preston hasn't stopped trying... 40/20. By far and away the Titans best. 9:32 PM Sep 18th from mobile web 9. Prediction: Parra outright premiership favourites with bookies by morning. 9:33 PM Sep 18th from mobile web 8. Just 2 minutes left... Do Parra have another try in them? Gold Coast haven't had one in them all night. 9:34 PM Sep 18th from mobile web 7. EF1 Final Score Parramatta 27 def. Gold Coast 2. 9:36 PM Sep 18th from mobile web 6. Nathan Hindmarsh is a superb footballer. Man of the Match by a length to MoiMoi and Grothe. 9:37 PM Sep 18th from mobile web 5. EF1 Final Score: Parramatta 27 (F Mateo, B Smith, K Kingston, J Wright; L Burt 5/5, J Hayne 1FG) defeated Gold Coast 2 (S Prince 1/1) at SFS 9:41 PM Sep 18th from web 4. @Shabangabang80 At 19-2 with 20 to go all I could think of was the 1998 semi... 9:42 PM Sep 18th from web in reply to Shabangabang80 3. EF1 Best: PAR- Hindmarsh, MoiMoi, Grothe, Robson, Hayne, Smith, Lowrie, Keating, Mateo. GLD- Campbell, Walker, Friend, Rogers, Minichiello. 9:48 PM Sep 18th from web 2. Congratulations to the Eels - way too good. The Titans it has to be said - were way too poor. Gold Coast join ten other teams on the greens. 9:51 PM Sep 18th from web 1. FuiFui's still no Darius Boyd. 9:56 PM Sep 18th from web ===================================================================== Final Score 1st Elimination Final 2009 PARRAMATTA EELS 27 Tries: F Mateo, B Smith, K Kingston, J Wright. Goals: L Burt 5/5. J Hayne 1 Field Goal. Defeated GOLD COAST TITANS 2 Tries: None. Goals: S Prince 1/1. @ Sydney Football Stadium, Sydney. Friday 18 September 2009. Official Man of the Match: FuiFui MoiMoi, Eels. NSC Man of the Match: Nathan Hindmarsh, Eels. Glenn Lazarus Player of the Finals Points: 5 - Nathan Hindmarsh, Eels. 2 - FuiFui MoiMoi, Eels. 1 - Eric Grothe Jr, Eels. Game Rating: 2 out of 5. One Line Game Review: Parramatta's defence has been spectacular but the attacks of the Titans and Dragons have been anything but, so let's see how the Dogs fare against the Parra 'wall'. ===================================================================== What the result means? Parramatta continue to march through the 2009 Finals and will take on the Bulldogs on Friday Night at ANZ Stadium - which could draw 65,000+ fans. The Gold Coast have an entire off-season to consider what went wrong... ================================================================================== This Week (Finals Week Three) - The Preliminary Finals PF1: Friday 25 September @ ANZ Stadium, Sydney BULLDOGS v EELS PF2: Saturday 26 September @ Etihad Stadium, Melbourne STORM v BRONCOS ELIMINATED TEAMS: Finals Week One: Finals Week Two: The best way to follow the 2009 Finals Series is to go to NRL_Finals_2009 on Twitter. During the first two weeks of operation, we produced 480+ Tweets - with some great nuggets of information in there, as well as news as it breaks. For the games themselves, regular Tweets will be uploaded giving you an instant evaluation of how the game is being played out and what to watch out for during the match. You can check out the In-Game Tweets within the Game Reports from all Semi Finals - just click on the linked articles on the drop down archive menu on the right of this page. So subscribe today and get involved with feedback - either here at wdnicolson.blogspot.com, at NRL_Finals_2009 on Twitter or via email wdnicolson@optusnet.com.au. Get on board and may the best team emerge from a great month of football to take the 2009 premiership. I could not see this game, which however already knew the results would be.